I was diagnosed with a calcified brain tumour. After 8 weeks on a purely vegan diet and using the Cancer Tutors MMS and DMSO protocol – the tumour dissapeared. The protocol consisted of using MSM and DMSO on a regular hourly basis. I also used Zeolite for good measure. I had my MRI 3 months later and there was no sign of a calcified tumour. They said they must have made a mistake – but I know it was the diet that got rid of it! I have been using DMSO for the last year for a variety of reasons. I used it with a combination of MMS (watch for this in another post) and citric acid to dissolve a small calcified tumour in my brain. My brain is now clear of tumour but still has some calcification. I frequently put DMSO on my arthritic fingers (I take my rings if first). I use it on my neck and back – both of which have some damage due to work injuries. Every time I use it I get some relief. 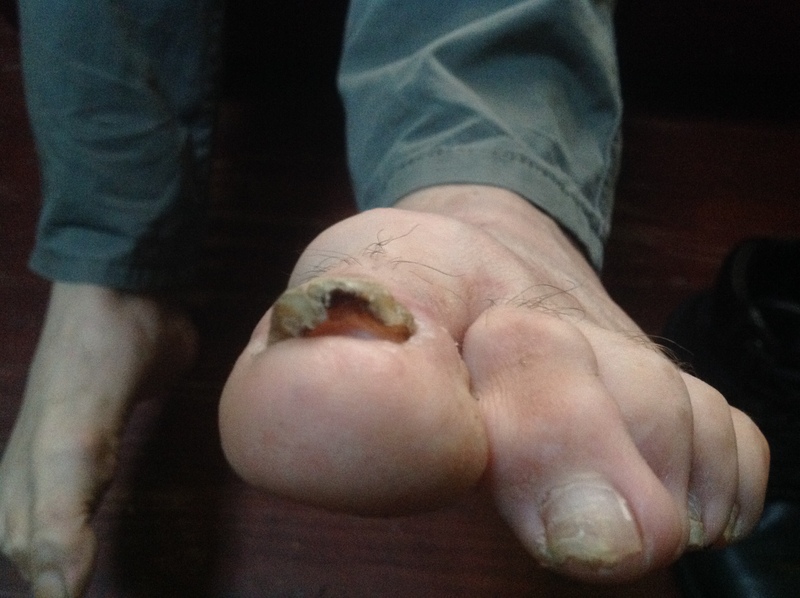 I have used DMSO to heal a fungus toe of a loved one! I took pictures each day of the improvements! Day 2 of DMSO treatment. There is a very special quality that DMSO has – it can actually penetrate and carry other medicines through the body! DMSO can carry other medications and substances through the skin and all through the body. The down side of this is that it will also carry alcohol and other substances through as well. Clean your hands and the area of your body it is going on – very thoroughly! For about an hour after you have used it keep yourself clean and away from any products it may may absorb. I have taken it internally – 1 tsp full to stop a sore throat, sinus infection and other viruses. It actually tastes really foul and leaves a very garlicky odour. Usually I avoid swallowing it but it only takes a couple of doses to make me better! DMSO is not approved by the FDA – there are a variety of reasons and excuses that they have. It is approved for some urinary tract infections. The most common reason given for not being able to approve it is that it has such a strong odour of garlic that it is not possible to do a double blind test. You can order it online or from animal or specialty stores. Make sure you get human grade DMSO. Below is an excerp I copied from Web Med – my favourite – go to place for medical information.www.webmd.com (viewed 1/6/14). It explains it succinctly and concisely. ‘DMSO is a prescription medicine and dietary supplement. It can be taken by mouth, applied to the skin (used topically), or injected into the veins (used intravenously or by IV). DMSO is taken by mouth, used topically, or given intravenously for the management of amyloidosis and related symptoms. Amyloidosis is a condition in which certain proteins are deposited abnormally in organs and tissues. DMSO is used topically to decrease pain and speed the healing of wounds, burns, and muscle and skeletal injuries. DMSO is also used topically to treat painful conditions such as headache, inflammation, osteoarthritis, rheumatoid arthritis, and severe facial pain called tic douloureux. It is used topically for eye conditions including cataracts, glaucoma, and problems with the retina; for foot conditions including bunions, calluses, and fungus on toenails; and for skin conditions including keloid scars and scleroderma. It is sometimes used topically to treat skin and tissue damage caused by chemotherapy when it leaks from the IV that is used to deliver it. DMSO is used either alone or in combination with a drug called idoxuridine to treat pain associated with shingles (herpes zoster infection). Intravenously, DMSO is used to lower abnormally high blood pressure in the brain. It is also given intravenously to treat bladder infections (interstitial cystitis) and chronic inflammatory bladder disease. The U.S. Food and Drug Administration (FDA) has approved certain DMSO products for placement inside the bladder to treat symptoms of chronic inflammatory bladder disease. DMSO is sometimes placed inside bile ducts with other medications to treat bile duct stones. In manufacturing, DMSO is used as an industrial solvent for herbicides, fungicides, antibiotics, and plant hormones. Medicinally, it is not approved for humans by the FDA. It is however, easy to buy over the internet or even from pet suppliers as it is used extensively by veterinarians and animal breeders, particularly horse breeders and racers. How does it work? DMSO helps medicines get through the skin and can effect protein, carbohydrates, fats, and water in the body. If you have aches and pains, injuries that flare up or other health problems – give DMSO a go. Just remember to change the areas that you put it on each day! It can irritate the skin. Put some aloe vera in the freezer and use it as required. Aloe vera is magical for fixing burns and skin irritations, just make sure it is not the bought aloe vera that even though it says it is pure, has alcohol in it as a preservative – OUCH! After spending a few days with my son staying over, he actually told me that he thought I had early onset dementia and that I needed to go and see a doctor! This did not go down very well but I came to realize that he was right. My memory was worse than it had ever been and I was having difficulty locking anything into my short term memory. I was getting confused with the least amount of stress and I had almost caused an accident whilst driving my son to the bus station. Hence his concern.